Congrats on making a really well made game! Love the spacey music. Great graphics audio and funny concept! Played trough five frames and I did start to get the hang of it the further I played. 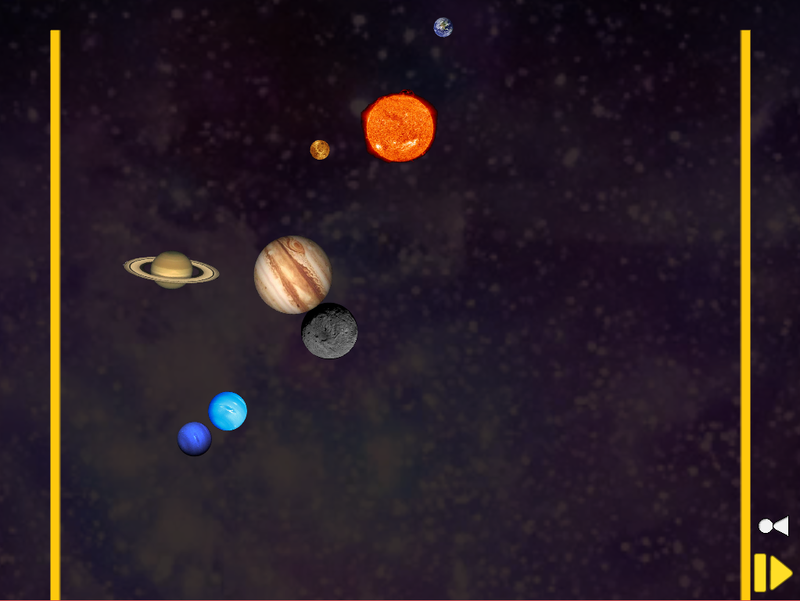 My general strategy was to first go vertically and try to target Jupiter while randomly getting some inner planets. Then depending on the situation I would snipe the furthest planets by following the side or try the middle again if I missed. The overlaid starmap helped with this quite a bit, especially so after I was able to estimate how much the planets would usually move before being hit. My best overall frame was 84, but my best individual throw was 50 (followed by 11 and 0 in the same frame...). It was quite hard to judge how much the asteroid would move horizontally during its travel based on the angle, so I ended up shooting mostly vertical shots. Some parts of the game could use a speed up in my opinion to take some of the waiting away from it. Cool idea, felt kind of too luck based, if that makes sense? I like the atmosphere of it all! Nice idea, but several aspects of the interface confused me. Why is the target system shadowed over the starting area? I also never managed to shot a ball/asteroid swiftly forward, all I could do was forward in a very slow speed or shooting it fastly backwards, having it bouncing off the lover end and then swiftly moving towards the system. However, I was always far from being able to aim and shot with a strategy, when I hit something it was pure luck. I didn't see the "leave a mark" topic integrated when it came to my mind that a mark is a bowling term, nice. Unfortunately I was far from leaving a mark in my trials. 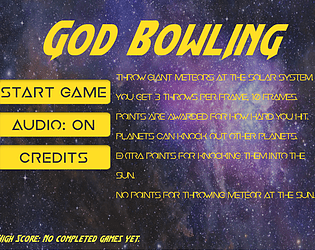 The idea came from a saying my mom used a lot when I was a kid, “I brought you into this world, I can take you out of it too!” My take on the theme was the idea that God is the one bowling with asteroids, which would leave a significant mark on us lol. 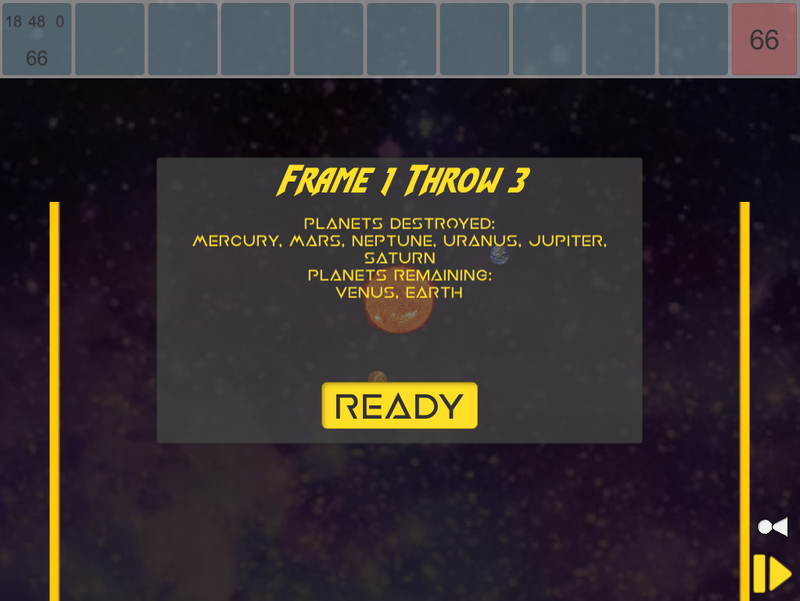 Maybe a bit of a stretch as far as meeting the theme :) For the targeting system, the idea for the overlay was to show where the planets are in orbit so that you could have a better chance of actually hitting them. Also, when you shoot your meteor, it rolls back at first, similar to a bowler’s initial backswing. Hopefully within the next week or so I’ll have time to make an in-game tutorial that will explain the controls. When I do, i’ll upload it as a post-jam build. Thanks again! When I run the executable I get an error saying that it's missing a data directory.